Alex and drummer Alessio D’Alessandro originally played together in what was to be the first of many bands at age 14, writing their own songs and covering punk hits in a garage belonging to Alessio’s father. Years later in 2010, the pair packed their bags for Berlin in 2010 in an effort to meet and perform with international musicians and to reach a broader audience. As new members were enlisted, what began as a small folk/blues outfit organically evolved into an original powerhouse soul act. After a year of playing sweaty shows in every dirty bar in Berlin, the band released their first record “Everything Boom!” on Off Label Records which was followed by a 7″ single “Decontrol” six months later. 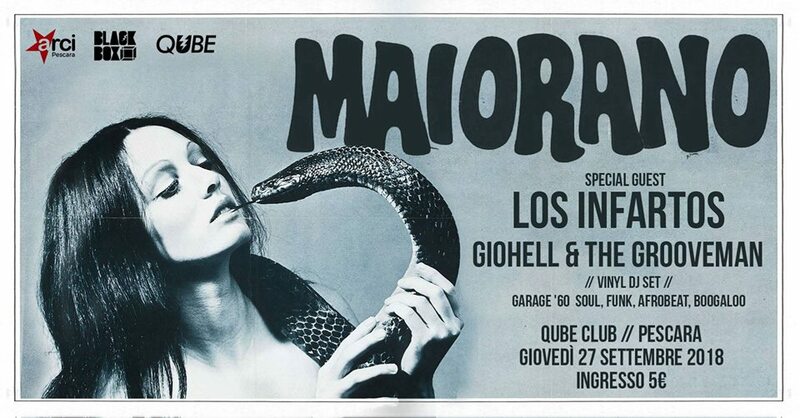 MAIORANO have since gained a reputation as a wild soul, rock and roll band that command the stage with an energetic live performance which promises to have audiences howlin', hollerin' and shakin' their hips every-time! Tastiera/voce principale, Federico Falconi - Chitarra/voce ) band formatasi a fine 2014. BOOGIES, I FARABUTTI e LOS EXPLOSIVOS. ad arrivare alla psichedelia tipica dei 60'. in the morning" e "Monkey", disponibile sia in vinile formato 7" che in audio CD. farvi letteralmente esplodere il cuore nel petto! dapprima solista incentrato più sul country e il blues, decide di unirsi a Timmy Romano, batterista veterano abruzzese, per arricchire i suoi brani inediti con beat talvolta spiazzanti e allo stesso tempo semplici.